In looking at how to read music we’ve talked about duration and how rhythm is built upon knowing what notes to play and for how long; but what about knowing when not to play? It is vital to be able to know when not to play. Thankfully, this is pretty straightforward. This means that we can combine notes and rests into the same bar. Let’s take a simple example, a combination of quarter notes (crotchets) and quarter note rests…. Notice how each of the quarter notes is held for a beat and then there is a beat of silence where the quarter note rest is. We can make it more complex by combining different rests…. In this example the combination of quarter note and eighth note rests gives a syncopated and funky groove to the music. If an instrument should not play for a bar then it will be written as follows…. 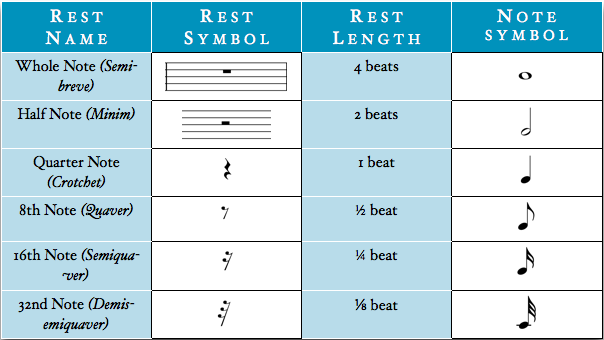 If an instrument should not play for more than one bar then it will be written as follows….. The above instrument should not play for the first 5 bars. Hopefully this is fairly straightforward. As always, the best way to learn any sort of rhythm is to have a go at clapping/playing it. If you’re looking for practical ways to learn how to read music then check out all the FREE content on my site – there’s videos, articles and worksheets to help you out. It’s all TOTALLY FREE!